Lalaloopsy has to be one of the cutiest toys for little girls, I have been waiting for my girls to be interested in it and in the past few months my oldest who is 7 years old has sparked interest in it. I love the funkiness and flare that they have along with the innocence of kids just wanting to have fun. 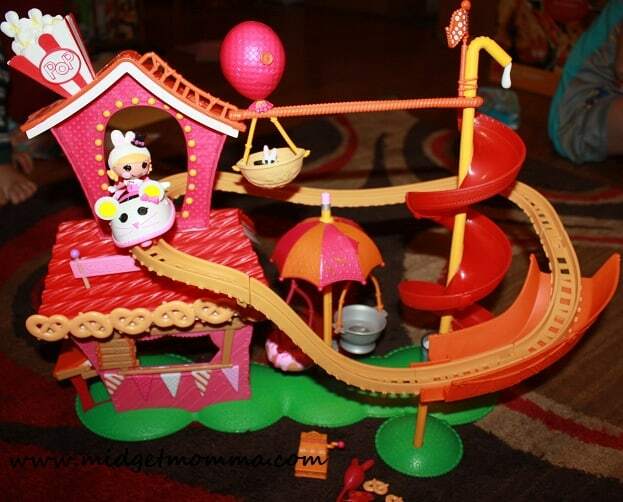 The Mini Lalaloopsy Silly Fun House Playset with Misty Mysterious has a TON of fun for kids to explore, with 2 different sides and 5 play areas there is never time to slow down on the fun. With a super fun roller coaster for Misty (and any of the other mini Lalaloopsy dolls you have), a twisty slide, 2 swings and a balloon ride there is tons to do at the fun house. If Lalaloopsy and friends get hungry they can head on over to the snack shack and grab a pretzel, and then a souvenir pinwheel and character balloon! All three of my kids loved playing with this, the only thing that was challenging was keeping the “pencil” that holds the track up in the green grass (there is a hole for it to go into and its a bit wobbly), that every so often we had to put back in. When it falls out it doesn’t make anything fall off it just makes the track not stay up where it is supposed to be. Putting it together was easy, it all snaps together quickly. You can purchase the Mini Lalaloopsy Silly Fun House Playset with Misty Mysterious on Amazon or in other local retail stores. Disclaimer: I was provided a promotional sample of this product. No compensation was received. All opinions are 100% my own. 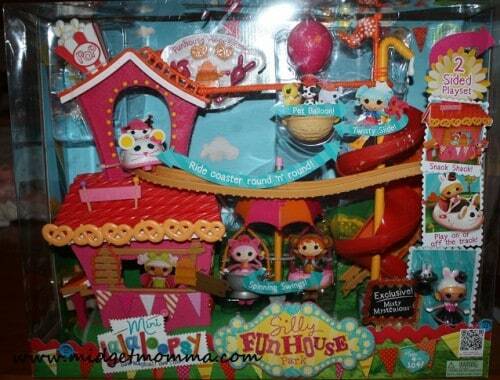 Do you have any lalaloopsy playhouse sets for sale? ?